What will our homes look like in the future? Packed with electronic controls and highly efficient gadgets, will they rapidly grow into strange, abstracted structures that bear little resemblance to our current houses? 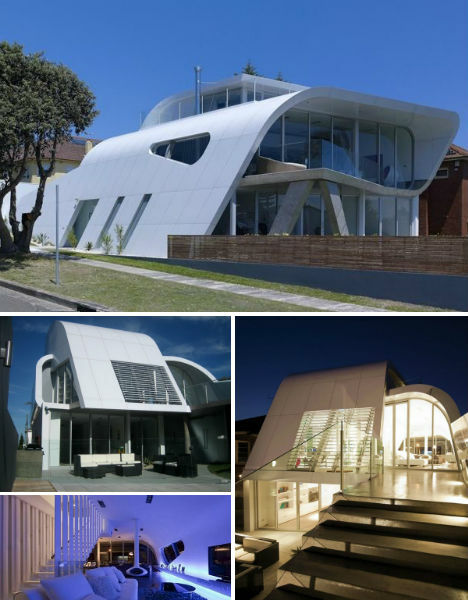 These 12 futuristic house designs from around the world may be indicative of what’s to come, or maybe in a few decades they’ll seem quaintly retro-futuristic, like spaceship houses from the 1950s. Either way, they’re fun to look at. 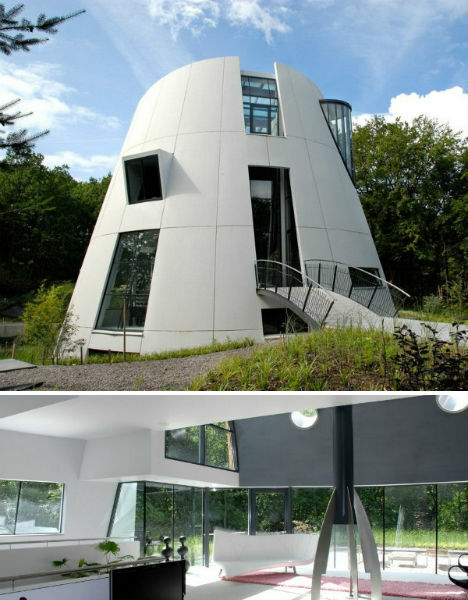 Is this the world’s most futuristic house design? Dupli Casa, designed by J. Mayer H. Architects, is a three-floor vila in Ludwigsburg, Germany with views of David Chipperfield’s Museum of MOdern Literature. Built in 2008, the angular design was based on the footprint of a pre-existing house that was completed in 1984. 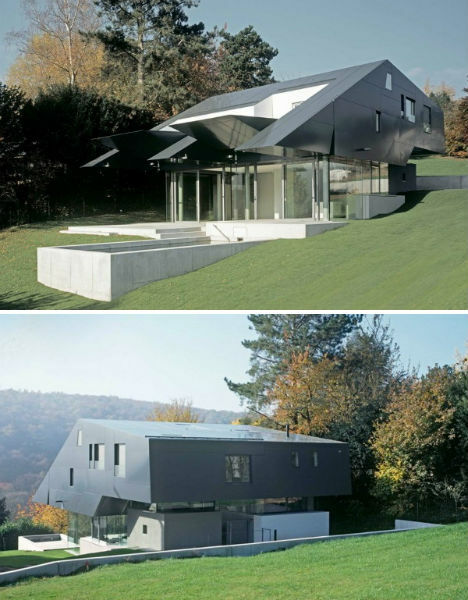 Inspired by a spaceship, House F is as geometric as the hillside in which it’s set is round, but somehow, it still achieves architecture firm Meixner Shulter Wendt’s goal of ‘easing itself into the landscape’. Local authorities stipulated a pitched roof, which doesn’t always fit into ultramodern aesthetic values, but the firm found a way to work with this rule, giving the home a hovering appearance with a dark cladded top floor and a glass-walled bottom floor. 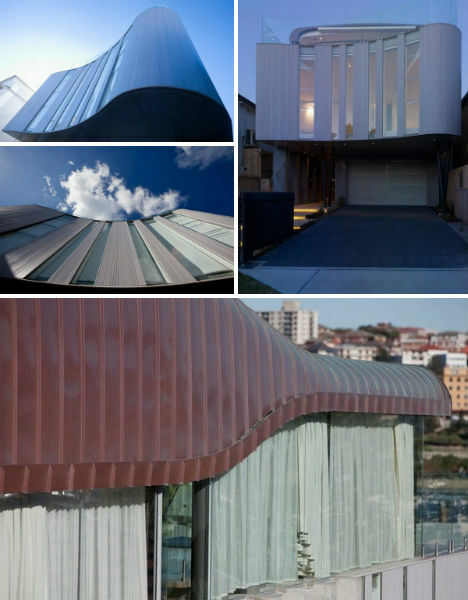 Rising above the more standard and traditional-styled houses on Australia’s Bondi Beach is the wave-shaped Starr Residence, an almost commercial-looking structure designed by Brian Meyerson Architects. Building on a challenging location can sometimes provoke amazingly creative solutions. 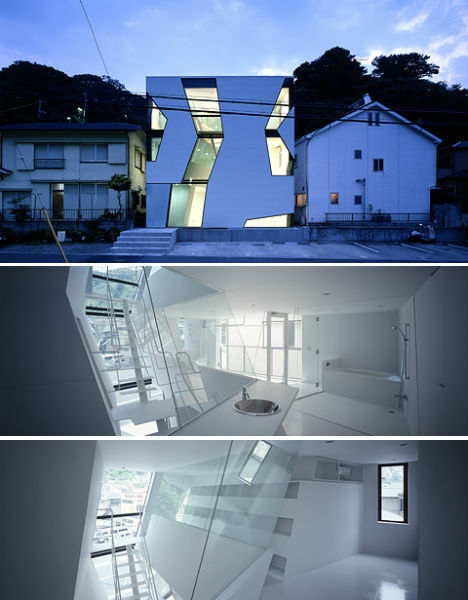 Case in point: the ‘Skew House’ in Tokyo, Japan, designed by October Ueda + Nakagawa Architects. A series of large, skewed white blocks, separated by panes of glass, extend over the cliffside above concrete ‘anchoring volumes’. 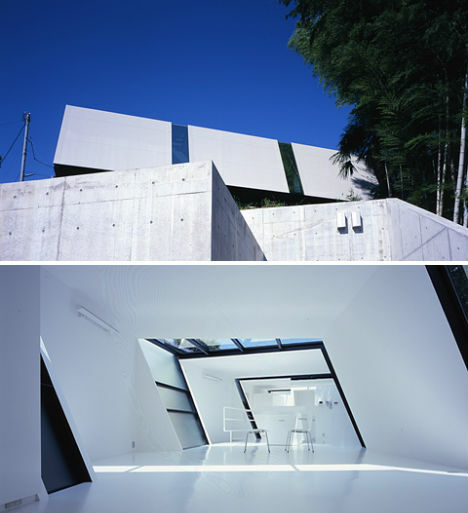 Inside, the effect is as if a rectangular house was pushed slightly off-kilter; the minimalism of the pure white walls adds to the somewhat otherworldly feel. 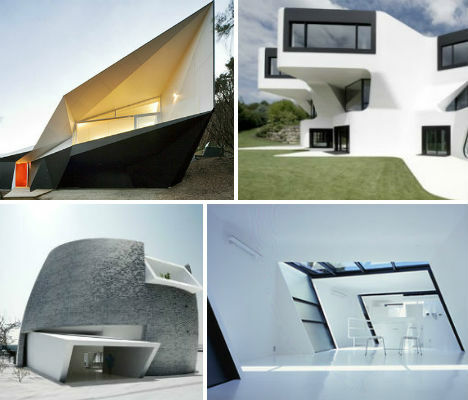 Would you expect anything other than an eye-popping, ultra-modern wonder of a house from architect Zaha Hadid? 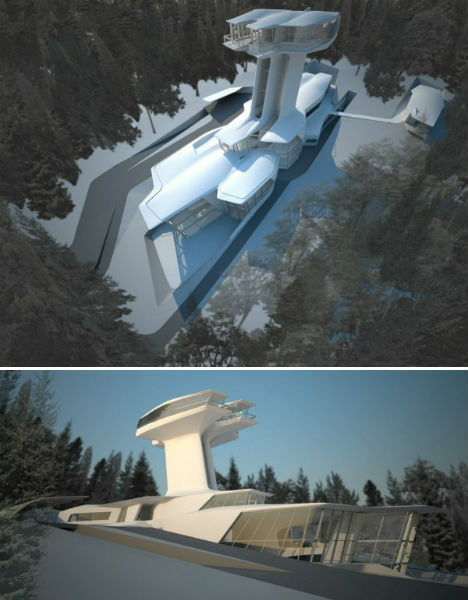 This hillside luxury residence in Barvikha, Russia is made of concrete, steel and glass and features four levels with the master suite elevated high above the trees for a premium view. Like a watchtower, this level is raised nearly 72 feet above the remaining floors on vertical shaft containing an elevator and staircase. Also by October Ueda + Nakagawa Architects, ‘Novela’ is a space-saving cube with large geometric cut-outs in the facade that let in lots of daylight. The clients wanted as much space as possible in the small footprint, as well as a space that’s visually interesting. The result, which includes all-white built-in furniture, certainly looks as if it’s from a different time period altogether than its more subdued neighbors. Looking something like a yacht that’s become embedded in the streets of Sydney, Australia, the Moebius House is far from typical. Architects Tony Owen Partners say that the design is an example of ‘liquid architecture’, “whereby projects are designed parametrically using 3-D digital software to respond to environmental issues.” The house features a distinctive roof shape, with one solid white wall extending over the house and then curving under the second floor to create a terrace. 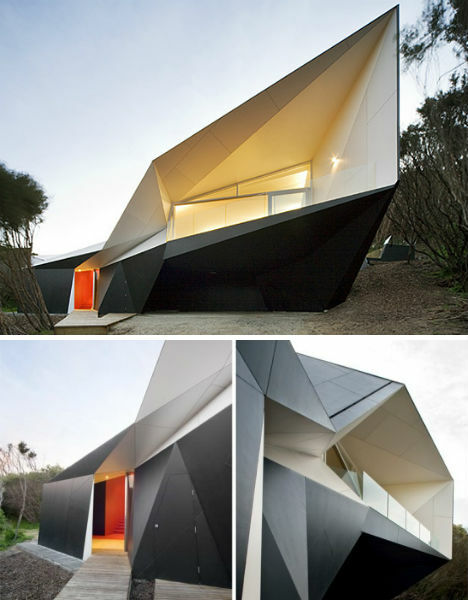 Named after the ‘Klein Bottle’ in mathematics, which is a surface with no distinction between the inside and outside, this holiday home an hour from Melbourne features a highly unusual, angular shape that hints at this mathematical inspiration. New technology like CAD allow homes like this to have highly complex designs. 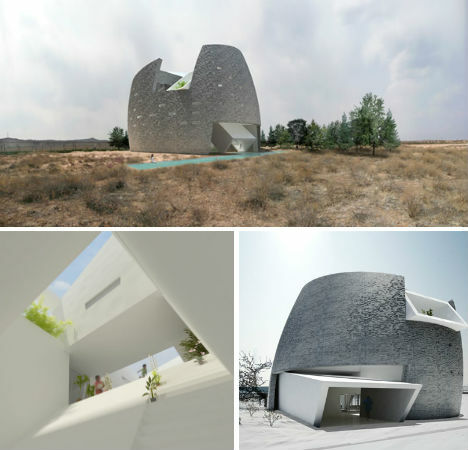 The Klein Bottle House is essentially a spiral, but because of its geometry, that’s difficult to see from the exterior. 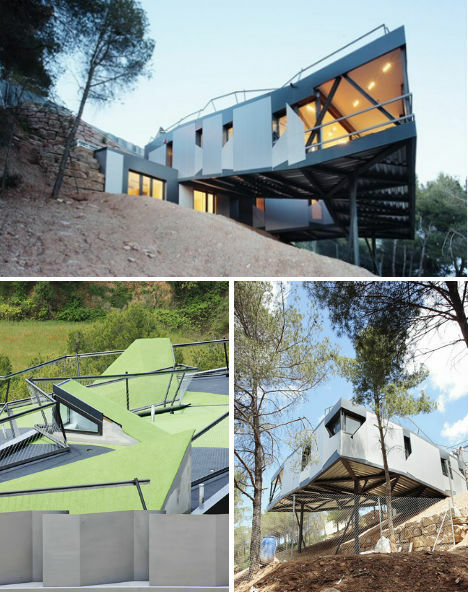 This house overlooking a verdant hillside in Spain looks strange enough as it is – but add in a rooftop golf course, and it lands on a list of highly unusual and futuristic houses. ADD+ Arquitectura built this home using a steel tube frame covered in aluminum panels. Seen as a step from the street and hillside above to the garden below, the green of the mini-golf course is a highly artificial but striking element in the landscape. An ultramodern, gleaming house like this is not exactly a sight you’d expect to see in Inner Mongolia, but the (X)House is actually part of the Ordos 100 Project showing off innovative residential designs. The exterior walls are made of black brick, which takes on an interesting patterned look thanks to the elliptical shape of the home. The design, by New York-based architects Multiplicities, takes its name from an X-shape in the interior of the house, which isn’t visible from outside. 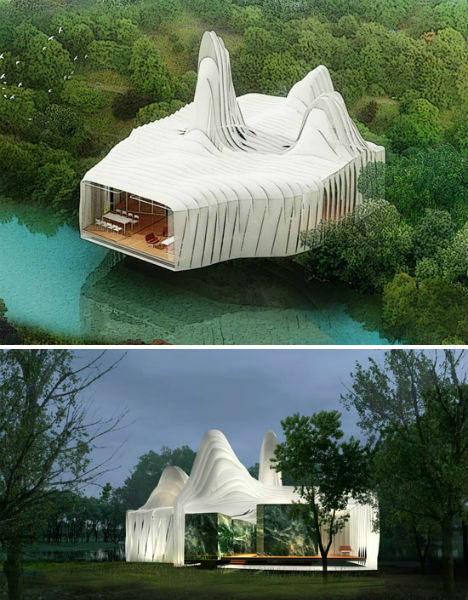 Like the world’s most elaborate tent, the Bird Island House for Sentul Park, Kuala Lumpur, Malaysia is covered in a silicone-coated glass fabric which changes transparency throughout the structure to let varying levels of light and views inside. The fabric twists and wraps around the bamboo frame, leaving common areas and passageways open to the breeze while other rooms are enclosed with full walls and glass. Half conical concrete, half traditionally shaped thatched roof, this house is definitely an interesting transition from the structures that normally dot the countryside in this little Dutch village. The concrete half shields the home from harsh direct sunlight while the back features glass portions that let in light.